The history of the Old Timers Museum dates back to 1856 when Peter L. Traver, a Gold Rush miner, opened a general merchandise store. He sold it to the Manuel Estate Co. in 1883 and they owned it when the warehouse caught fire in 1893 and exploded. It was later sold to Riley Senter. Three major fires occurred in Murphys in 1859, 1874 and 1893. 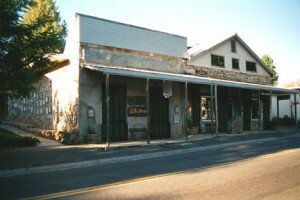 The Traver building was one of a handful of buildings to withstand all three due to its stone construction, iron shutters and roof which once held a layer of sand. By 1949, the building had fallen into disrepair and was scheduled for demolition. Dr. Coke Wood, a frequent visitor to the area, and his wife, Ethelyn, purchased and restored the building. Dr. and Mrs. Wood also convinced local families to donate and loan historical artifacts to what would become the museum in honor of the town’s centennial celebration. Up until 2016, the buildings and grounds were owned by descendants of the Woods. It operates as a community museum, staffed entirely by volunteers and supported by donations and the sales of books and souvenirs. The Murphys Old Timers Museum also operates as a 501(c)(3) non-profit, community-based organization with a board of directors. Our purpose is to inform and educate the public about the rich history of the Murphys area, especially of the Gold Rush period and of the Native American and other cultures that once prospered here. The museum has an extensive collection of mining artifacts, period clothing, photographs, news clippings and journals of pioneer families as well as superb examples of Miwok and other tribal basketry and tools. Our area’s first families, hotels, businesses, churches and doctors are also well-documented in ledgers, records, tintypes and personal effects. Pivotal to the collection is the story of Irish immigrant Martin Murphy and his family who settled many other California towns and cities. Sons Daniel and John lent their name to a major gold strike in the region – Murphys Diggins – and for whom the town was eventually named. The late historian Dr. Wood wrote that more than $5 million in gold was taken from just four acres south of the Historic Murphys Hotel in an area frequented by Dr. Albert Michelson, famed American Nobel Prize winner, and his boyhood friends. Wood also noted Wells Fargo shipped more than $15 million worth of gold dust from the active camp in the 1850s & 1860s. Murphys was one of California’s richest “diggins.” Such riches attracted fortune hunters and adventure seekers from around the world – gamblers, opportunists, ladies of easy virtue and honest men as well as renowned outlaws – among them Joaquin Murietta and Black Bart. Many of their stories can be traced through the writings, photographs and memorabilia preserved in the museum. Contact Tim Chisholm at 209-728-8511 or our manager, Ron Fillmore, at 209-728-1160.